Last month, our friends Tania Lyon and David Yeager presented at the Carnegie Foundation Summit on Lean in Education on their research and experience in spreading a culture of continuous improvement. Tania Lyon has been a KaiNexus customer for the last couple of years and has led her team to accomplish some astounding results in her position as Director of Organizational Process Improvement. David Yeager is an Assistant Professor of Psychology and a Faculty Research Associate at UT Austin and will be presenting his research at the KaiNexus User Conference later this year. St. Clair Hospital is a non-profit independent 329-bed hospital in Pittsburgh, PA with about 2400 employees across multiple locations. 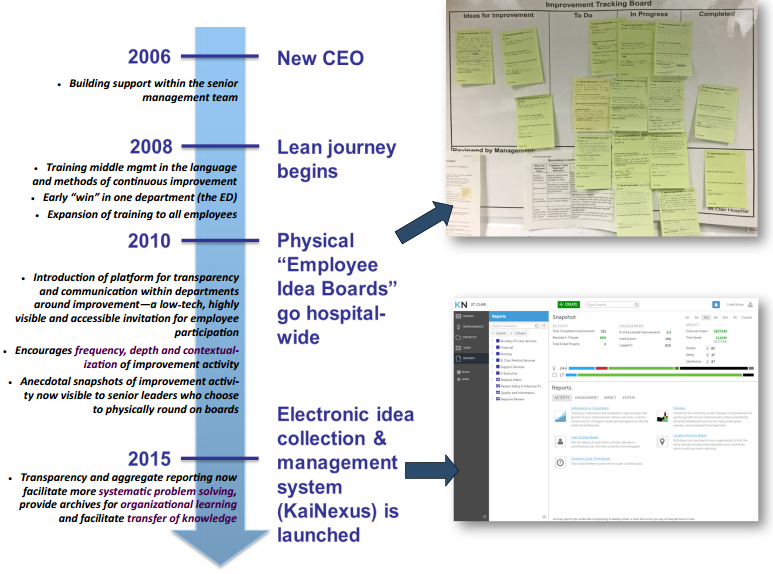 In 2008, the Hospital began a journey to become a continuously improving organization when senior management adopted Lean (an adaptation of the Toyota Production System) as its chosen improvement philosophy and methodology. Achieve and sustain a robust organizational culture of continuous improvement using Toyota/Lean. One of the core tenets of the Toyota Way is a deep respect for the expertise of its front line workers. Organizations that adopt this approach develop every employee as scientific observers of their own work and design systems to support employees as full participants in identifying and solving problems every day. By every measure—patient safety, quality of care, patient satisfaction, financial strength—this journey has taken St. Clair in the right direction, beginning with the dramatic turnaround of its struggling Emergency Department, one of the busiest in western Pennsylvania. Leadership from the top—full support of the CEO and COO. A person dedicated full time to supporting organizational culture change and improvement. Adoption of a single organizational “language” for improvement (lean), making it easier to communicate and problem solve within as well as across departments and locations. An early “win”—proof of concept that this approach works in the organization (the ED turnaround). A universal platform for communicating and documenting improvement—you cannot improve what you cannot see (your staff’s problem-solving skills) or measure (staff engagement in and impact of improvement). By 2010, St. Clair Hospital had developed a system of paper-based "Employee Idea Boards," and began to take them hospital-wide. This physical post-its-on-the-wall system was low-tech and low-cost (and subsequently easy to implement) as well as visible, tangible, and accessible (making it easier for people to participate). On the flip side, the paper system provided limited space for information, could only be seen by people in that location, and afforded no aggregate reporting without intensive manual intervention. As the Hospital’s improvement culture matured and more staff become involved, there was a greater need for visibility into both the quality and extent of problem-solving. They needed a system with more capability. You can measure quality improvement with any number of desired outcome metrics, but how do you measure the health and growth of your improvement culture? During the course of this journey, the team at St. Clair determined that in order to evaluate and improve the health and growth of their improvement culture, they needed to measure 3 key areas. This was made possible by the introduction of KaiNexus' continuous improvement software. PARTICIPATION/SPREAD: How many and what percentage of employees and departments are active in the system? This visibility tells the team where to send their limited improvement coaching resources. When participation levels and/ or volume are low, it is usually an indicator that the manager needs more support and encouragement on how to promote a culture of improvement within their department. Being able to give feedback to individuals and departments on the impact their improvement work has on the organization overall generates satisfaction and enthusiasm to do more! It also supports more objective performance evaluations. The system is equally transparent about quality; coaches have insight into how individuals document their problem-solving process. Strong examples can be showcased for organizational learning, and weaker examples can receive targeted coaching. It takes time for an improvement culture to mature— be patient. How did St. Clair improve engagement year over year? A major factor was making participation in KaiNexus (the new electronic platform) one of the organizational goals that is tracked and reported on at every monthly leadership meeting. The goal has both a quantity and a quality component: in order to be counted, an improvement must include quantitative data—a simple indicator of using the scientific method. “Improvement” work doesn’t have to mean “extra” work. Healthcare professionals and managers are already fighting fires and solving problems every day; becoming a continuously improving organization doesn’t have to mean adding more problems to the pile, it means becoming systematic, disciplined and scientific about how you solve your daily problems. And as you get more systematic about truly solving problems instead of building temporary workarounds, you begin to reduce the number of fires you have to put out and win back more minutes in your day which you can then reinvest in building even greater stability and standardization into work processes. Beware the quota system for stimulating participation at the departmental or individual level. Quality, not quantity. Use tracking systems for the visibility they provide into the quality of your organization’s problem-solving skills, not to drive quantity. Don’t waste time incentivizing people who already feel they have too much to do to game the system. Use your improvement tracking system to document work that leadership is already required to do. In most organizations, improvement work is perceived as yet another item on their to-do list. When managers were asked to use the new system to document projects already required and underway for regulatory compliance (their annual department Performance Improvement Plan), they got their feet wet and learned to appreciate its strengths — transparency, collaborative potential and the assistance of templates to ensure a standard process for working through a problem. KaiNexus achieved buy-in from most of the management team within a year. No problem is too small to work on. At the heart of Toyota is its culture of kaizen or “incremental improvement.” Rather than jump from major project to major project, Toyota trusts in the cumulative power of many small improvements made to daily work every day with the help of every employee. Tracking software allows an organization to capture every small improvement, which may not feel significant by itself, but when reported in aggregate begins to show a collective impact across an entire department/location or over an entire year. Providing that aggregate data back to employees encourages ongoing participation and helps individuals connect to a larger enterprise of continuous improvement. For more information about this presentation, you can download the presentation poster in PDF format here. To learn more about St. Clair's improvement journey, experience with continuous improvement software, and results, check out this free webinar hosted by Tania Lyon!